Fact: I get told off for getting games purely because they have cats in them! If a game has a cat on the cover or in the game, I end up with it! A lot of the time these games are rubbish. I have been told I am not allowed any more cat games without doing research into the actual game. 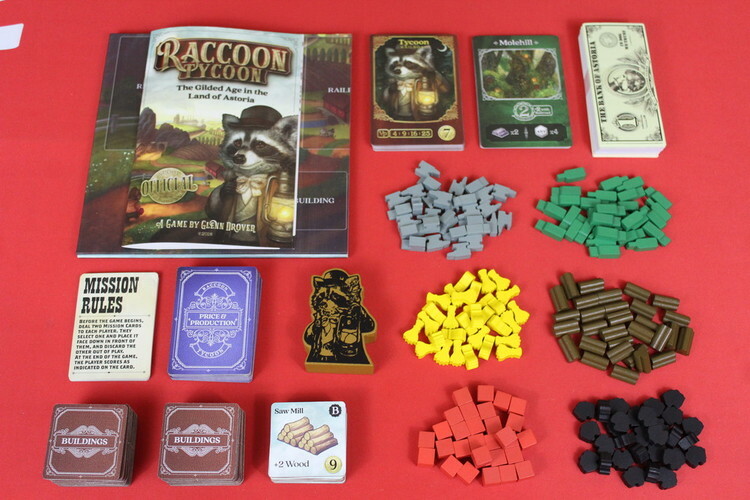 Fact: Raccoon Tycoon is a game with cats that is good! Place the board in the centre of the table. 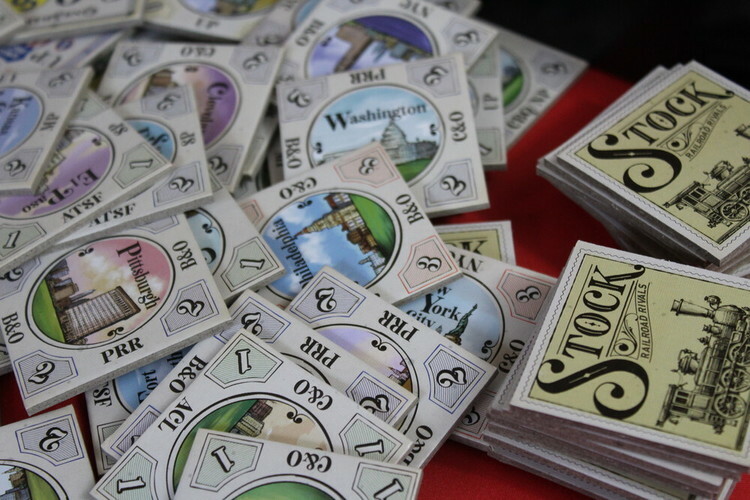 Put one of each commodity token on the lowest price on the corresponding market track, $1 for wheat and wood, $2 for iron and coal, and $3 for goods and luxuries. Create the railroad deck by removing specific railroads depending on the number of players. 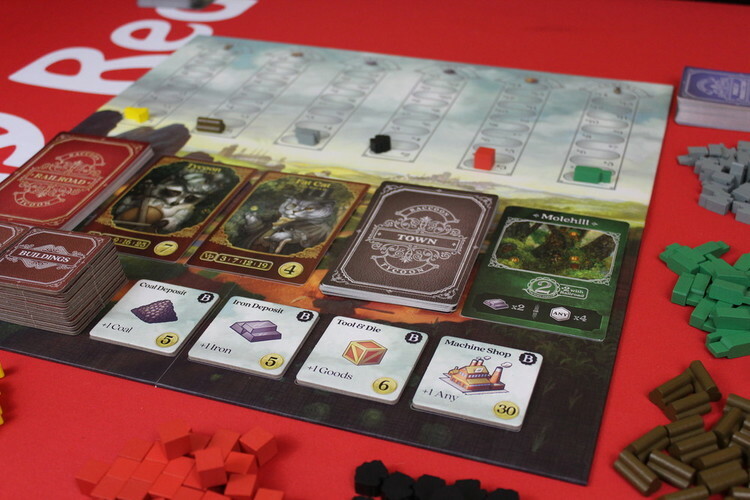 For 5 players use all cards, 4 players remove Skunkworks, 3 players remove Skunkworks and Tycoon and 2 players remove Skunkworks, Sly Fox and Tycoon Railroads. Shuffle the remaining cards to form the Railroad Deck. Place the deck on the marked spot on the board and turn over the top two cards and place them on the spots next to the deck. These will be the cards initially available for auction. Shuffle the six basic commodity building tiles and place four of them, at random, on the building locations on the board, make sure they have the +1 side face up. Place the others back in the box. Shuffle the advanced building tiles and place them in a single stack. Whenever a building tile is bought, the display must be replenished from here so there are always four buildings available to buy. Choose a starting player and give them the (most excellent!) start player marker. They gain one free commodity of their choice, the second player two and so on. 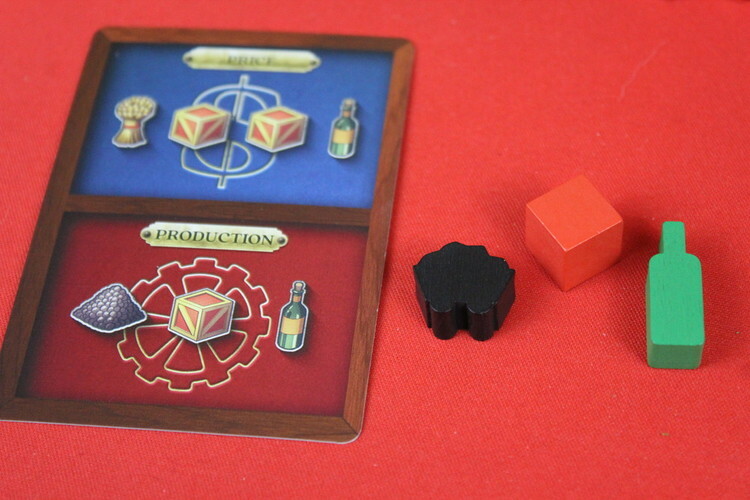 No player may choose two matching commodities. You are now ready to play! Price and Production - Play a price and production card from your hand. Gain three of the commodities shown on the top half of the card. If more than three are shown, you must choose which ones you want. The bottom half of the card is the ‘price’ section. After taking resources, increase the price of all commodities shown in this bottom half by one dollar. Move the appropriate markers on the commodity market tracks on the game board. 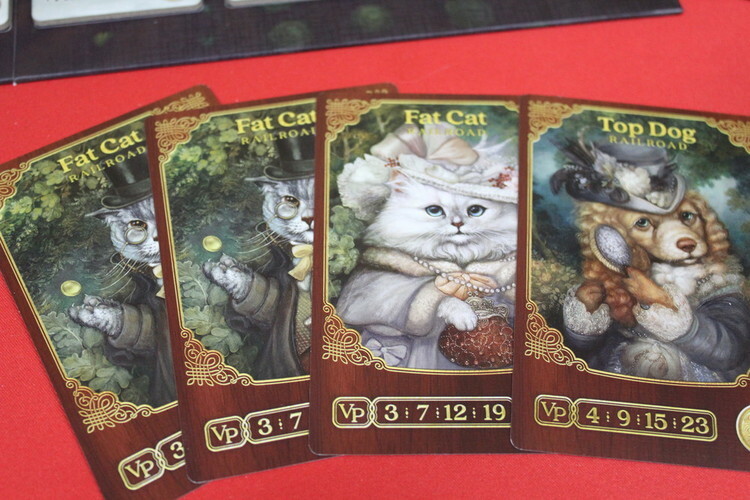 After doing the production and price actions, discard the card and draw up from the deck. You should always have three cards in hand (unless you have buildings that allow for more) Each player may only have ten commodities at any time. However, the limit is raised by one for each building they have in play so if you have two buildings in play you may have up to twelve commodities at any time. Sell a Commodity - You may sell any number of a single type of commodity you have. Return the commodities to the general supply, take the current market value for each. Then reduce the current value of that commodity by one for each unit sold. For example, if you sold four wood, the price of wood would drop by four dollars. Start a Railroad Auction - Select one of the two available railroad cards and begin an auction for it. The minimum starting bid is shown on the card. Each player bids in turn or passes, if a player passes they may not bid at a later stage. The player who wins the bid places the railroad card in front of them and the display is refilled. If the player who initiated the auction does not win, then they may perform another action, even initiating a second auction if they wish. Purchase a Building Tile - Select one of the four building tiles on display, pay the cost indicated on it and place it in front of you, you will gain the benefit for the rest of the game. Immediately restock the display. The initial commodity building tiles, as well as some of the advanced building tiles, are double-sided. You may use a purchase building action to upgrade the tile by paying the cost shown on the +2 side and flipping the tile over. Purchase a Town - All town cards have two purchase prices - either pay the specific commodities as shown on the card or pay the total of ‘any commodities’ as shown on the card. These may be the same or different commodities. Place the town card face up in front of you. 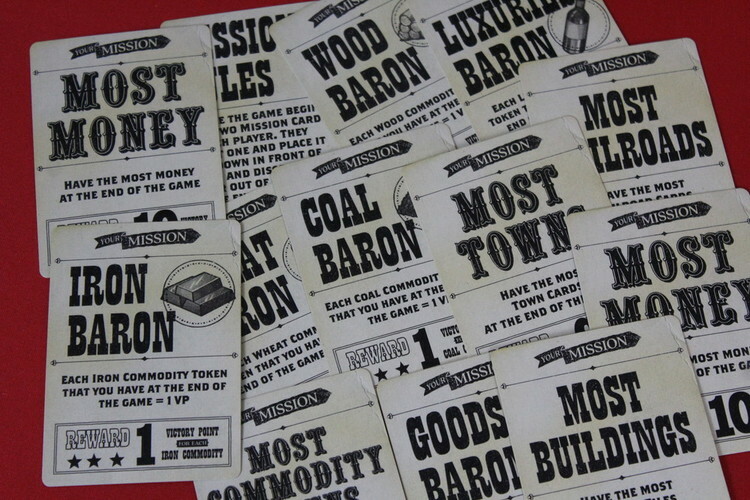 During the game, all players town cards, buildings and railroads are open information and must be kept visible. Money, however, is secret and may be kept hidden from other players. 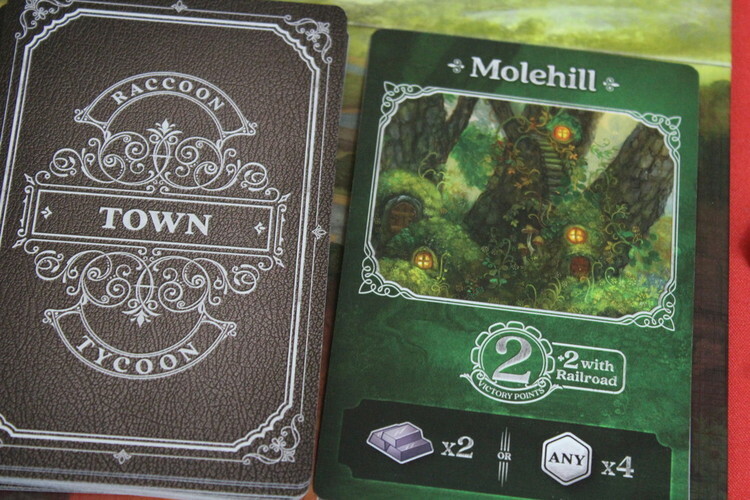 The games ends when either the last Railroad has been auctioned or if the last Town card is purchased. Play to the end of the round (to the player on the right of the starting player) then scoring occurs. Each town and railroad pair owned by a player is worth 2 VPs eg a player owns 4 railroads and 3 towns, they have three pairs so would score six points. The player with the most victory points is the winner, in the case of a tie, the player with the most money wins! This is a great game, with beautiful components, artwork and gameplay.